Compared to the previous three entries in the Geeky Fashion series, there are plenty of geeky full-zip hoodies (hoodies that zip all the way up to cover the face often forming a mask), but I want to submit these design ideas, which as far as I can tell do not exist yet (feel free to correct me). Some of the more obvious choices, like Spider-Man or Star Wars, have already been done. Designed these based on what I want to wear, and as usual I kept the designs simple (just like me). The ones I see currently on the market are a bit too busy or skewered towards the kids. The ‘skull’ design looks cool, but it’s not very fashionable for everyday wear. All of these full-zip hoodies would feature plastic lenses for the eyes to see through. The windy/rainy days I’ve recently encountered made me wish for hoodies like these. I won’t name them, I figure they are pretty self-explanatory (Commenters feel free to list them). The third one is a general ‘hockey goalie’ design, and could be applied to all NHL teams. The last one, well, I tried to do something with headgear/goggles, but it didn’t look right. Makes for a cool regular hoodie, if I may say so. UPDATE: Here are a few more. 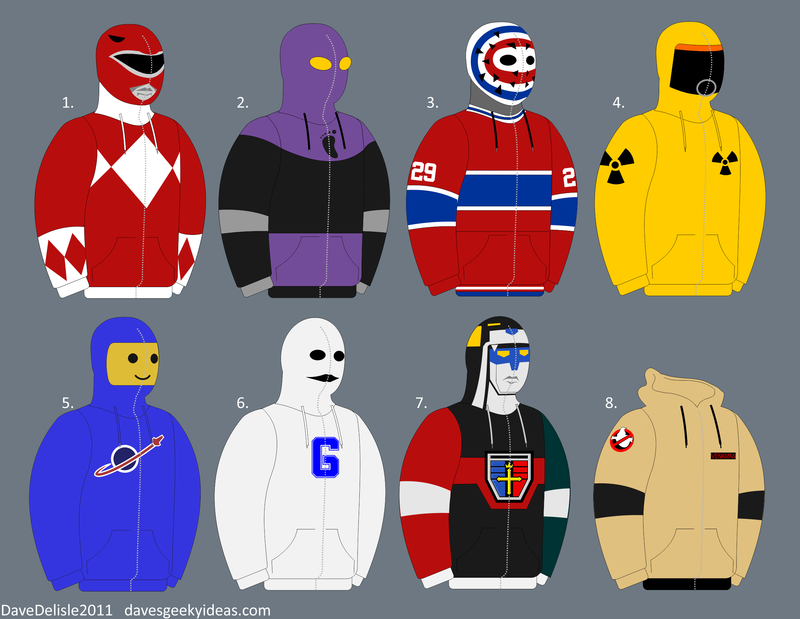 The last one is pretty cool, but the rest I am heavily biased against because I hate full-zip hoodies. But yeah, the Ghostbusters is cool because it’s a simple, unassuming design with a unique color combination. The tan isn’t a color you normally see hoodies in, and the black details look awesome with it. These are awesome. I’d love to get a chance to buy these. That’s “The Human Being” mascot from Greendale Community College, from NBC’s Community. He/she/it looks that creepy. I would love to know how much this go for. I would buy #4 in a second. I would love to know how much these go for. I would buy #4 in a second. I wish I knew a company that specialized in these. If anyone knows of a dedicated full-zip company, let me know. The ones I have found so far only dabble in full-zips (like Mark Ecko), but it’s not their primary item. How about a Racer X/Speed Racer one? That’s a good idea! Conjures up Mega Man and Mega Man X too. There’s almost no price point where I wouldn’t buy that Greendale hoodie. Go Human beings!! NBC has been pretty good lately at offering goods seen in episodes (like those #AnniesMove green T-shirts). Hopefully they notice the novelty and appeal of this item. I would pay so much money for that Human Being hoodie. I want the Voltron hoodie. Where can I get one? As of now, nowhere. But I am looking for someone who can make these. OMG I love the footsoldier one! Would buy a GB hoodie like that in a heartbeat. I would pay a LOT of money for the Red Ranger one. 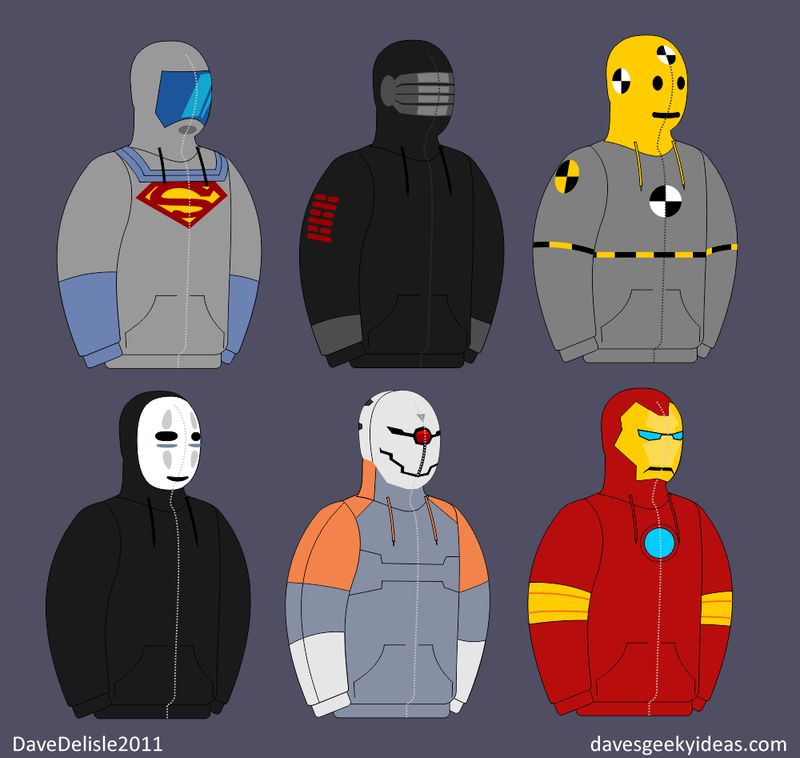 I would love Gray Wolf (Cyborg Ninja), Red Ranger, or the Foot hoodie, please let me know when these start to sell haha. Mother of God. You think about starting an email list for if/when you find someone to make those bad boys? I know I’d want to have a heads up. I’d pretty much buy all but the hockey one on the first pic and the crash test dummy, kabuki and Iron Man on the second one. Also I hope more than just the red ranger would be available. Also a spiderman/venom would be cool too. I only post stuff on this blog that doesn’t exist (the running theme here), which is why Spidey and Venom aren’t here – they are widely available. You can probably do a quick Google search and buy one. The Red Ranger is just indicative of all 5 Rangers. Just wanted to get the basic idea across. I want want want the ghostbusters. I just found your blog and holy carp I love your ideas. Aw thanks. Do stay tuned! I’m just a designer, not a manufacturer. I cannot make or sell these currently. how can l get a medium Voltron hoodie#7? how much? It’s just a design, sorry! I would love to buy several of them if they made them in adult sizes!